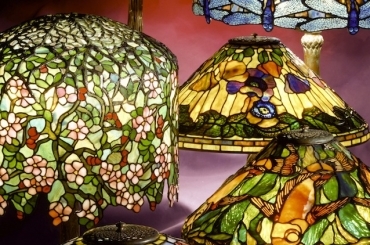 Lets get things started right away with one of the largest Tiffany patterns we create. The 28″ Magnolia shade is one of Tiffany Studio’s signature lamp designs and the generous size of this shade works well as a standing floor lamp or as a chandelier fixture. The shade pictured was completed in July 2008 for a local client. The flowering Saucer Magnolia tree was a favorite motif of Louis Comfort Tiffany, and he had magnolia windows created for his home in Long Island, New York (these windows now can be seen at the Morse Museum in Winter Park, Florida). 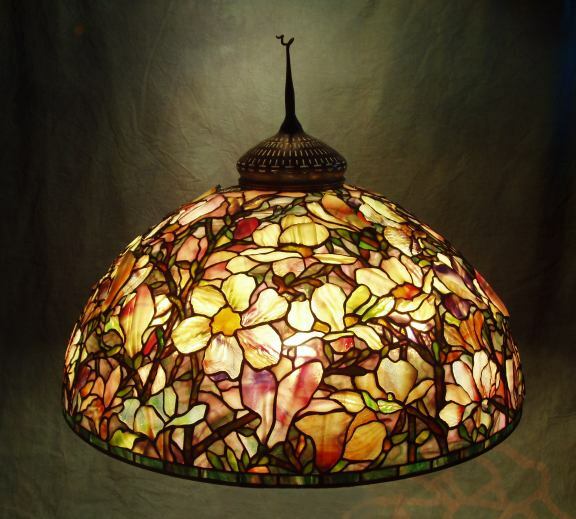 Because flowers in Tiffany lamps are generally rendered life size to the actual plant, the magnolia blossom was only created as a large shade. When this spectacular shade is used on a Senior Floor base, the lamp gives the impression of a tree in the full bloom of springtime! In order to give the magnolia shade a realistic, three dimensional look we often use “drapery glass” for the large flower petals. This heavily folded glass is an extreme ripple with an undulating surface. Originally created by Tiffany’s glassmakers for use in figural windows to replicate the folds of material on a garment, drapery glass is hand folded while hot to give the sheets of glass their unique look.